▪ Available colors: Black, White, Red, Blue, Clear or customized colors. ▪ Install quickly, easily and securely on any of 31.8/25.4/22.2mm handlebars. 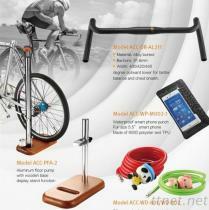 Esportes & entretenimento, Acessórios da bicicleta, Bicicleta Accessories/n.e.s.